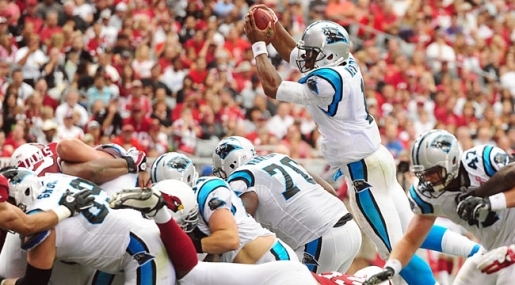 Cam Newton, leaping over the Arizona Cardinals. When Cam Newton’s potential was discussed during his college career, the big knock on him was his arm and accuracy. The national championship-winning quarterback was big, fast, and had a very strong arm, but could he throw the ball with touch and read NFL defenses? Well, if you can take his debut into account, the answer to those questions is a resounding yes. While the Carolina Panthers lost to the Arizona Cardinals 28-21, Panthers fans have a reason to smile. Cameron Newton completed 24 of 37 passes for 422 yards and 2 touchdowns versus only one interception, setting a NFL rookie record in the process. Only one other rookie in his first year has ever thrown for as many yards (Detroit Lions quarterback Matthew Stafford did it in 2009); no other rookie has thrown for that many yards in his debut start. It remains to be seen if Newton can keep up this momentum, but for a debut? It’s pretty spectacular. Say what you want to about his character (due to the NCAA investigation and the laptop stealing at Florida), but Newton is obviously a talented quarterback.